Over 600 people gathered in the fields of al Mughayyir for the Friday prayers, in order to honour the martyr Hamdi Nasaan and to claim their right to their lands. Shortly after, the Israeli military attacked the people to disperse them from their land. People remained steadfast and claimed their land for hours. Over 20 have been injured, 7 have been shot with live ammunition. Al Mughayyir is being targeted since decades by the illegal settlers that have built their settlements and outposts on and around the village lands. Settlers invade the village, force farmers off their own lands and damage and destroy crops and olive trees. All of this under the supervision and often escorted by the Israeli military. 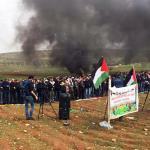 Lately, the settler-lead aggression escalated and last Saturday they staged a deadly invasion. Settlers, backed up by the Israeli military entered the village and targeted the inhabitants in their way. Hamdi Naasan, a father of four children, was shot with live ammunition in the back and diead shortly after in the hospital of the wound. 30 others were injured the same night, six with live ammunition. In the meanwhile, the Israeli military was increasing the charge, shooting live and rubber-coated bullets as well as stun granades towards the villagers. In 2018, settler violence has drastically increased with over 490 incidents reported compared to 140 during 2017. These attacks are part of an overall escalation of Israeli policies of displacement and land confiscation. Within a framework of complete impunity, Israel’s aggression and apartheid can only be stopped by continued grassroots struggle and global popular solidarity.